The latest collection of 48 new Holmes stories published by MX to help preserve the former home of Sir Arthur Conan Doyle. To be released concurrently with Part VII on October 31, 2017. 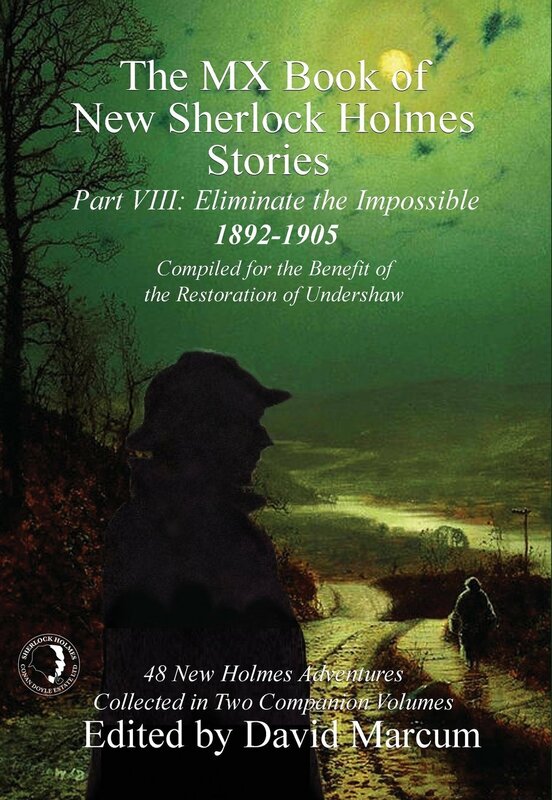 Part VIII - Eliminate the Impossible: 1892-1905 features contributions by: Deana Baran, Tim Symonds, Sandor Jay Sonnen, Ben Cardall, Andrew Lane, Michael Mallory, Wendy C. Fries, Aaron Smith, Arthur Hall, Robert Perret, Nick Cardillo, Paul D. Gilbert, Cindy Dye, Tracy Revels, Derrick Belanger, William Meikle, Marcia Wilson, David Friend, Roger Riccard, Craig Janacek, Jeremy Branton Holstein, Will Murray, David Ruffle, Daniel McGachey, and David Marcum, with a poem by Christopher James, and forewords by David Marcum, Lee Child, Rand Lee, Michael Cox, and Melissa Farnham.